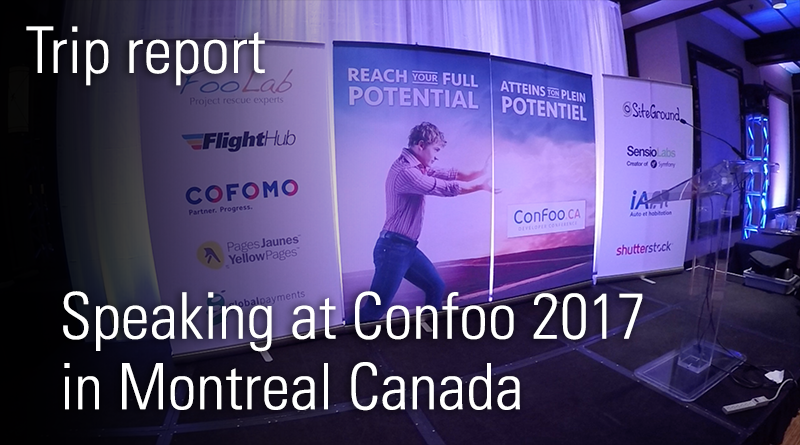 Confoo is a multi-technology conference for webdevelopers in Montreal. I was invited to speak at the event and did 2 presentations: one about Varnish, and one about ElasticSearch. It wasn’t my first time in Montreal and it wasn’t my first time at Confoo. This was already my 3rd Confoo and it’s still as lovely as the previous editions. This wouldn’t be a proper trip report without the actual video. Here it is: my week in Montreal summarized in 9 minutes. It was a challenge to keep it that “short”. Hopefully this video gives you a sense of the vibe when I’m on the road. Traveling across the Atlantic for free, staying in cool hotels, hanging out with interesting people, having good food. Seems like I got it all figured out right? Not really! These trips come with a mission and that missions is to evangelize. Increase my social following on Twitter and Instagram. My first presentation took place on Thursday and was called Varnish In Action. It was an opportunity to convey my knowledge about Varnish and to share my philosophy about developer empowerment, and the power of using HTTP best-practices. Awesome talk on #Varnish today @ThijsFeryn. My second presentation was on Friday and was about ElasticSearch. The titel of the talk wasn’t that original: ElasticSearch In Action. I need to come up with more original titles. Good job Anna & Yann! The journey is always an important part of the trip. I’m a bit of an airline and hotel loyalty geek. This mean I pick my flights, train rides, cab rides and hotels carefully. For this trip I went with Brussels Airlines from Brussels to Toronto and Air Canada from Toronto to Montreal. I’m fully aware that there’s a direct flight to Montreal, but I just like Brussels Airlines a lot. I got to hang out at various airport lounges. Some were good, some were OK, one was really good. It’s been a while since I last flew from pier B in Brussels. Apparently the non-Schengen Brussels Airlines lounge was remodeled and is now called The Suite. The international Air Canada Maple Leaf lounge in Montreal was spectacular. It lots of natural light, the furniture was modern, there was some green there. But the coolest feature: a chef who makes fresh Asian stir fry. The international Air Canada Maple Leaf lounge in Toronto was big, boring, but it had a nice hot buffet. The conference hotel was Hotel Bonaventure. That’s also where the conference is. It’s located right in the Downtown area, across from Central Station. It’s modern, it’s not charming, but it’s still more than good enough. The previous time I stayed there, it was a still a Hilton. I did notice some remodeling in the lobby. The hotel comes with a nice executive lounge where you get complimentary breakfast, snacks and drinks. I booked a room that allowed me to access that lounge. Very convenient and not more expensive than the full-blown breakfast buffet in the restaurant. I also liked the heated outdoor pool. With temperatures at around -18° C, being outside in your swimming trunks is rather interesting. Loved the hot tub, didn’t like the freezing cold entering and leaving it. Normal people would book there complete stay there, I’m not normal. Because of my loyalty to Starwood Hotels and the SPG program, because of my love for the W Hotel brand and because it was reasonably priced, I stayed at W Montreal the first and last night of my trip. As an SPG gold member, I get complimentary upgrades. They upgraded me to a fabulous room without me having to ask. Wow! Fancy #hotel room. ❤️ @whotels ! I really enjoyed the W, I loved the room, I loved the friendly staff and having pancakes with Canadian maple syrup for breakfast is awesome! 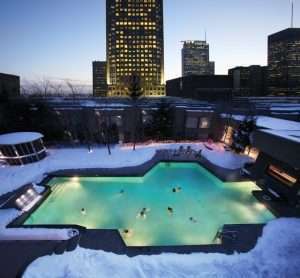 Montreal is a great city, the Confoo crew runs an awesome event, the activities were great, the journey was enjoyable.